LAKE OSWEGO, Ore., Oct. 16, 2017 /PRNewswire/ -- Treasure Investments Corporation unveils the original life-size masterpiece sculpture of the Laocoon Group and will now make it available for lease or purchase in bronze and pure silver. This incredible statue was discovered in January 1505 buried in the ground of a Rome vineyard owned by Felice De' Fredis. One of the first experts to attend the excavation site was Michelangelo, the famous Renaissance sculptor, who was especially impressed by the huge scale of the work as well as its impressive aesthetics. Pope Julius II, a lover of Greek art, ordered the work be brought immediately to the Vatican, where it was installed in the Belvedere Court Garden. The Laocoon Group had a significant impact on Italian Renaissance art and rapidly became one of the most studied, revered and copied works of ancient art ever put on display. Believed to be created sometime between 42-20 BCE, experts give credit to the creation of the piece by three sculptors – Hagesander, Athenodoros and Polydorus. As described in Virgil's Aeneid, Laocoon was a Trojan priest. When the Greeks, who were holding Troy under siege, left the famous Trojan Horse on the beach, Laocoon tried to warn the Trojan leaders against bringing it into the city, in case it was a trap. The Greek goddess Athena, acting as protector of the Greeks, punished Laocoon for his interference by having him and his two sons attacked by the giant sea serpents Porces and Chariboea. In the sculpture, one son can be seen to break free from the snakes, and looks across to see his father and brother in their agony. Mark Russo, CEO of Treasure Investments Corporation was at the Vatican in 2003 negotiating a licensing agreement with the Vatican Library for the marketing rights to numerous pieces of fine art and while there discovered and purchased the world- famous sculpture foundry "Chiurazzi" in 2004, located in Naples, Italy. The Chiurazzi foundry, which owns over 1650 master moulds, is where Russo was able to obtain the Laocoon image as the foundry was granted access from the Vatican in 1972 and was allowed to create the plaster mould directly from the marble original. Russo subsequently sold the foundry, however, during his ownership selected nine of the most important pieces in art history from the foundry's treasury and had a second set of moulds made in Oregon. 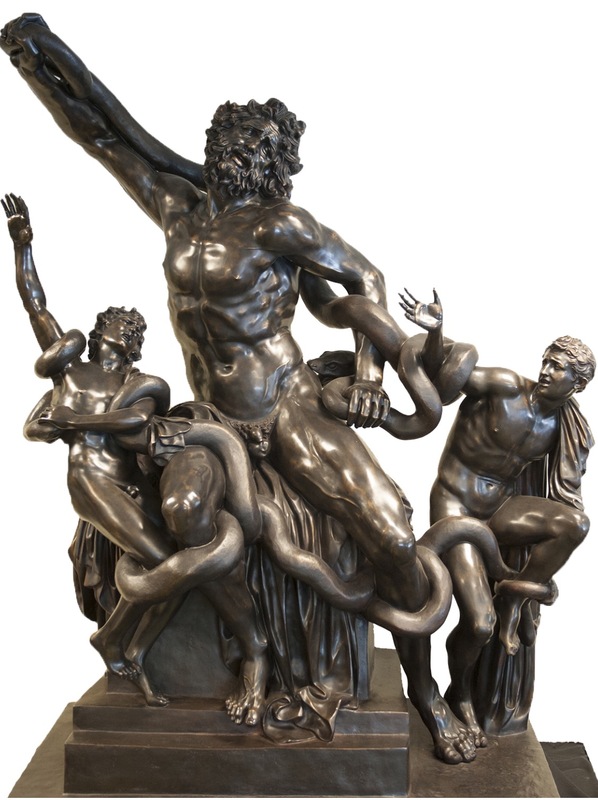 Only five of the Laocoon Group pieces have ever been cast and all are considered posthumous first edition originals. Only four more are scheduled to be cast in bronze and will be priced at $2.5 million each. One will be cast in 25,000 ounces of .999 pure silver and will be priced at $10 million USD. TIC will offer the bronze pieces for lease at a fraction of the sales price on an annual basis. The history of the foundry is truly amazing and currently is back in the ownership of the Italian government. "One of the smartest things I have ever done was to create a second set of moulds for nine treasured masterpieces from the foundry. It is very unlikely that any more castings will ever be created from the Chiurazzi mould collection now that it is back in the hands of the Italian government," says Russo. The name Chiurazzi is both familiar to and held in reverence by aficionados and collectors of Italian Art, Renaissance Art history and classical antiquities. The Chiurazzi Collection of moulds, taken directly from original sculptures, has been described as "the most expansive collection of artistic bronze sculpture moulds ever to be assembled – in the history of the world." Essentially, The Chiurazzi Collection is a national archive of Italian sculpture. The Chiurazzi Foundry has indeed established a unique legacy in the world of ancient works of art. Many of the premier museums in the world, including The Louvre Museum in Paris, The Harvard Museum in Cambridge, The Pushkin State Museum in Moscow, and The Carnegie Museum in Pittsburgh display masterpieces immortalized by the artisans and craftsmen of the Chiurazzi Foundry of Naples, Italy. The Foundry, established in 1870 by Gennaro Chiurrazi, quickly became the world's premier foundry for bronze castings. In 1885, The Chiurazzi School was established. There, generations of artisans have been trained to accurately replicate bronze sculptures where the intent, inspiration, passion, and skills of Masters are clear upon first viewing and detailed examination. The Chiurazzi-produced sculptures are masterpieces themselves. Due to the Foundry's prominence, in 1890 the Italian Ministry of Cultural Goods and Activities chose Chiurazzi to go into the National Archaeological Museum in Naples to take moulds of every artwork in the museum. This National Archaeological Museum is the storehouse for the original treasures excavated from Pompeii and Herculaneum. This creation of moulds from original works of art and antiquities was subsequently expanded to other museums throughout Italy and other places where originals were housed. Moulds were created in Rome, the Vatican, The Louvre, the Olympic Museum, the Copenhagen and British Museums. The first of the great assets of the Chiurazzi Foundry is the ability to produce posthumous, first-edition originals from these moulds. These castings, limited by international art protocol to editions of nine, are highly sought-after by collectors and museums alike – and therefore command significant prices. Never before has the international public been afforded the opportunity to own numbered, limited-edition masterpieces of historic fine art cast from moulds created from the artists' only existing originals. The intent of both The Italian Ministry of Cultural Goods & Activities and the original mould makers was to preserve civilization's most treasured fine art. These ministers and artisans saw themselves as historians and curators. For more than 120 years, The Chiurazzi Collection of moulds has been used to create masterpieces for an exclusive selection of famous museums and discerning collectors. The Chiurazzi Foundry, because of its workmanship, gained exclusive access to many museum collections. These collections include; The National Archaeological Museum, Naples, Vatican Museum, The Louvre, Villa Borghese, Uffizi Gallery, Olympic Museum, Copenhagen Museum, British Museums, Bargello Museum, San Pietro, and many others. "We are very excited to unveil the other eight priceless pieces that are coming to market from our European collection. Each and every one is truly a masterpiece and were created by the greatest artists on earth," says Russo. Treasure Investments provides high-end limited-edition bronze sculptures for charity fundraising events as well as creating and distributing its world-class images to fine art galleries in the United States. The subject matter of these pieces ranges from wildlife themes to historical, cultural, western, and biblical. Treasure Investments Corporation has amassed a master mould collection of more than 700 original works of art including many works from world-famous artists, Lorenzo Ghiglieri and Laran Ghiglieri, as well as master moulds that originated from the Vatican and the Villa Borghese Museum in Rome. Bernini and Michelangelo are among the artists that are included in the mould collection. The company has a strong focus on philanthropy. One of their main business divisions is their charity auction program, which provides fine art pieces for fundraising events and auctions. The unique business model sets the company apart from the rest. Russo created this innovative model in 1998 by placing valuable bronze castings into gala charity fundraising events; sharing the revenue from the final sale of the pieces with the nonprofit, no strings attached. The first piece sold for $63,000. This model has subsequently created tens of millions of dollars in monetary contributions to the nonprofits. "Treasure Investments Corp is now positioned to be the premier provider of high-end bronze sculptures for nonprofit auctions throughout the United States," says Russo. "With more than 600,000 live charity auctions per year, and growing daily, the ability for Treasure Investments Corp to scale its auction model is beyond exciting for just one of its profit centers." Treasure Investments Corp has a diverse business platform, creating and providing fine art in original sculptures from small desk top images and collectibles to larger than life heroic monuments. The company's master mold collection contains hundreds of original molds from world-famous artists in the United States and Europe. For more information, visit Fineart1.com.